We have avocado and sesame seed sushi (I didn't do inside out rolls this time because I find they turn out smaller this way), sweet potato stars with brown sugar and butter, little container of soy sauce, little chicken dumplings, and slightly sweetened tamagoyaki with asparagus centers. For fruit and veggies, there are snow peas, a sliver of flower shaped daikon, green pepper hearts, carrot butterflies, red pepper tulips, green and yellow zuchinni slices, broccoli, a cinnamon bun flavoured truffle, strawberry slices, pineapple wedges and blueberries. BF took me out for lunch today, so I didn't make bentos. So I thought instead I would show you something that arrived earlier this week...a bubble tea kit!!! I first got hooked on bubble tea when I lived in Ontario, and since I got back to Nova Scotia, the only place I could find it was a little Vietnamese restaurant downtown. But since I didn't want to buy dinner every time I wanted bubble tea, I decided to try to make it at home. The kit is from this ebay seller. For those who aren't familiar, bubble tea is a milky green tea drink that is usually flavoured. You drink it with a wide straw because it has large balls of tapioca at the bottom. I think the idea is that that the tapioca gives you something to chew on between sips. The kit included four bags of flavoured powder (green apple, papaya and two of red bean), three bags of tapioca (two black and one rainbow) and a big bag of large straws. It took me about three tries to get the recipe right, so here it is. For two glasses of bubble tea you boil three heaping tablespoons of tapioca balls with a couple tablespoons of brown sugar for fifteen minutes. In each glass, put two generous teaspoons of flavour powder and two of sugar. Fill the glass half way with green tea and stir until the powders are dissolved. Fill the rest of the glass with milk (skim or 1% is best because it's already pretty heavy). Add half the tapioca balls to each glass and then add some ice cubes and a wide straw. I think most places use powdered milk, and then fill the glass with green tea, but I'd rather use real milk because powdered milk creeps me out a little and this tastes the same. And that's how you make delicious bubble tea! I have enough stuff here to make about 60 or 70 glasses so hopefully that will last me a while. On the bottom we have pork onigiri surrounded by lamb strips fried with cabbage. I actually bought a cut of lamb this time instead of skewers but I ended up cutting it into bit size chunks anyway, so next time I'll probably just get the skewers again. Then there are a couple of bits of asparagus, snow peas and broccoli, leek dumplings (frozen) and sesame fried bok choy. On the top we have sweet potato cakes, grapes, plums, berries, tomatos and a date square with cheddar bits underneath. I wasn't going to pair plum and grapes together again, but after I cut up the plum, I swear I looked in the fridge and every single other fruit I had was orange (and I already had lots of orange from the sweet potato). Oranges, blood oranges, persimmons, gooseberries...it was almost funny because all I was looking for was something that wasn't orange! So it was grapes again. I'm pretty happy with the way today's bentos turned out. I made a one tier for BF and a two tier for me since my one tier wasn't deep enough to hold the onigiris. I made onigiris last night, and this time I filled them with delicious red bean paste, and put some extra salt on the outside. I also hid some black sesame seeds on the bottom of them. This was the first time I've used the round mould and they were the best onigiri I've made yet. After failed attempts at truffles and petits fours, I finally managed to make some tiny desserts! You can't really tell from this photo, but they're really tiny, about an inch square, so just right for bento. The 'muffin cups' they're in are actually truffle sized. Here's the recipe. The only thing I did differently is that I cut the recipe in half and used a wide loaf pan instead of a square pan, and I chilled them in the fridge when they were done so that I could cut them really small without breaking them. Hopefully I will get better at making fancy desserts. I've been checking out Amazon for some good books, I'll let you know what I find! Behold: Slacker bentos! BF took me out for sushi at our favorite sushi restaurant last night, and we had some leftovers, so into the bentos they went! Today I had the exact opposite problem from yesterday. Instead of running out of ideas of what to put in the bentos, I ran out of room for everything I wanted to put in. The bottom has left over sushi (Unagi for the boy, sweet potato tempura for me....mmmm), marinated chicken bites, a gooseberry, and small containers of wasabi, ginger and soy sauce hidden under some steamed broccoli. I bought a mandolin slicer at the mall last night (half price!) so I tested it out by julienning (is that a word?) some carrot, green pepper and daikon, and sauteed them in a little oil for a few minutes until slightly crispy. They were yummy. Underneath that are a couple of bites of gouda. Then we have a small onigiri since there isn't all that much rice in the sushi, blood orange wedges, grapes, strawberries, blueberries and a champagne flavoured truffle (from Laura Secord). Today was my first attempt at single tiered bentos. I got about halfway through, and then realized I had only planned the first half! After that I just started throwing things in at random. So today we have beef rolls in ricepaper. BF really liked them. They had a really unique flavour and were super fun to make. I made them last night, the recipe is below. I included a pork onigiri, but then that seemed like a lot of rice so for a little more carbs I made boiled sweet potato flowers with brown sugar and butter. Veggies were boiled edamame with salt, asparagus with butter, cucumber flowers and snow peas. For fruit, star shaped kiwi, strawberries, blueberries, a gooseberry and a couple of orange slices. There are a couple of pieces of cheese in there, and a home made green tea truffle (the recipe is here, but they didn't turn out very delicious, so I don't really recommend it). I was amazed at how much these bento boxes held, especially considering that volume-wise they're a little smaller than the two tiered boxes we usually use. Mix together the first five ingredients and let sit for about twenty minutes. Fry up the mixture until the ground beef is cooked. Remove from heat and drain well. Mix in the lemongrass, chopped mint, hoisin sauce. One at a time, dip a sheet of rice paper in warm water. Place 1 Tbsp of the meat mixture in the center of the rice paper and roll it up, folding in the sides along the way. Slice green onions in half lengthwise and tie around the center of each roll. In the morning when preparing bento, fry in a little canola oil, about a minute and a half on each side. This is almost too silly to post. When we woke up this morning, I suggested to BF that we make a special easter breakfast, so he offered to do this baked egg/meat/veggie thing that he makes that is so delicious. And he was kind enough to humor me by using the star pan, which I hadn't had a chance to use yet. So while he was busy in the kitchen, I felt like playing around, so I made ham and nori bunnies and cheese shapes to make them just a little more Easter-y. I didn't actually think the bunnies would survive the oven (I figured they would sink), but you can actually still make them out, although all the cheese decorations melted into blobs of course. So all in all, we had a fun and silly Easter morning. I just thought I'd share since it involved a lot of cute food! On the bottom we have sesame fried bok choy (I love the way this makes my whole home smell in the morning), steamed asparagus, and some udon noodles with lamb. I made the noodles the night before. Boil them for three minutes, boil the carrots for one minute (they're sliced very thin), then fry up the noodles, carrot and sweet peas in the tiniest amount of oil and a couple teaspoons of Thai peanut satay sauce and a couple of tablespoons of water. I covered them with saran wrap and refrigerated while still warm, and then reheated in the microwave in the morning. I fried up the lamb in the morning and added it to the noodles. The top was me basically just throwing in whatever I could find. Green grapes, a boiled quail egg, more plum wedges (because they were so delicious yesterday), half a mini Babybel, blueberries, another cornmeal and red bean muffin from the batch frozen earlier in the week and a daifuku. For anyone who's not familiar, daifuku is made from rice flour, and stuffed with red bean paste. They're kind of a strange consistency, but I really like them (BF wasn't so keen) and they're not too sweet. 2. I really botched mine this morning! I tried to make Hello Kitty out of furikake and it looked ridiculous. For the bottom I made rice with daikon cubes (marinated in soy sauce first), green onion and bonito flakes, and teryaki beef (premade skewer from the butcher). The lion is made out of thin omelette. I used the dark side (the side that touches the pan) to do the body, tail and paws, and then flipped it over and did the mane out of the light side. I used the cutters I posted last week. His face is made from nori (I used a punch), the grass is edamame and "ROAR!" is spelled with cheddar cheese (I bought a set of Wilton alphabet fondant cutters at Michaels on the weekend). So this is my first attempt at omelette art and I'm happy with how it turned out. I made all the parts the night before and in the morning I just had to assemble it. BF said it was still intact when he opened his bento. Top is gyoza from the batch I made last weekend (they freeze really nicely) with dipping sauce (half soy sauce, half rice vinegar), steamed zucchini, sliced plums, a mini kiwi, a couple cucumber flowers and a french mint chocolate from Laura Secord. Possibly the yummiest bentos yet! I'm going to try to give more detailed descriptions of how I make them from now on, so if my posts start getting longer, that's why. On the bottom, there are breaded chicken cutlets, fried in a little oil, steamed asparagus with a little butter, blanched snow peas for space fillers. I made the rice last night with a mold I got off ebay that makes five rice balls at a time. They remind me of Tater Tots :) I added sushi vingar to the rice and tucked a small piece of avocado in the middle of each one. This is my new favorite mold, rice is so easy to eat and yummy this way. I've been buying little lunch sized cuts of meat from the butcher that are mostly prepared, and then frying them up in the morning. It's the quickest easiest method I've found so far. For example the chicken in today's bento was already breaded and seasoned, I just had to fry it and cut it into bite sizes. For the top, I made little 'salads' with canned mandarin oranges, chopped chinese cabbage and a dressing made from rice vinegar, canola oil and pepper. Last night, in my bento excitement, I made mini cornmeal muffins (BF surprised me with a mini muffin pan last night in support of my quest for tiny, adorable bento foods), with sweetened red bean filling. I used this recipe, and filled the muffin pans with batter half way, then added a dollop of red bean paste, and then filled them the rest of the way with batter. I used foil candy cups (instead of muffin cups) to protect the muffins from moisture from the fruit in the bento box. They turned out awesome. The red bean is almost like a jam, so they didn't need butter. Chopsticks, salt, pepper, soy sauce and a couple of sticks of Pocky. I also packed small containers of tonkatsu sauce for the chicken seperately in my bento bag. This morning I woke up at 6:30AM. I laid in bed for a little while debating on whether or not to get up and make a bento since BF had the day off. Then I remembered the delicious pork tenderloin roast stuffed with mozzerella and spinach that we had for supper last night, and thought that leftovers would be delicious for lunch today, so I rolled out of bed and stumbled into the kitchen only to find that there were in fact, no leftovers from last night. It's the regular combo of fruits and vegs. I didn't do anything special with them this morning, they're all steamed or boiled. I brought salt and pepper packets, so they were good to go. The bottom layer has three vegetable dumplings and the top has a heart shaped onigiri and a couple of pork shumai. As you can see, I decided to try the quail eggs (they take 3 minutes to boil) and thankfully they taste just like normal eggs! Also on the bottom are these tiny little kiwis that I found at the grocery store yesterday. They're the size of cherry tomatos and the taste is indistinguishable from a full grown kiwi (plus they don't have any fur). Perfect bento food!! I got one of my new bento boxes in the mail today. The story behind this one is that when I first saw how small BF's bento box was, I panicked and bought a bigger one online (although now we know his bento is a good size for him). This thing is huge. 1320ml. Yup, almost a litre and a half. Each tier is bigger than my whole blue bento box! But it's fabulous. It's such a nice bento box quality wise, and it's a great design that you can use either one or two tiered. So I'll be able to pack him lunches in the single tier, and in the summer we can use it to pack picnic lunches for both of us! Sorry about the lack of posts over the past couple of days. I didn't make bentos on Friday because BF had the day off work so we ended up going out for lunch together instead. He's off tomorrow too, so I haven't decided if I'm going to make bentos tomorrow or not. So now I need to figure out some different ways to prepare them and how long it takes to boil them because they're so tiny. As an example of how small they are, according to the nutritional information on the back, 5 eggs have 80 calories total. For normal eggs, 1 egg has 80 calories. Other fun stuff I found: aburage (tofu puffs) for making inari sushi, daifuku (little cakes filled with red bean), little tiny snack packs of rice crackers, green tea flavoured Pocky. The noodles were a success this time! Bottom is beef yaki udon with chinese cabbage and carrots, bok choy stir fried in sesame oil and teriyaki marinade. Possibly the yummiest bento main dish yet. Top is a flower shaped boiled egg, steamed broccoli. There are a few bites of fried okra under the broccoli (I didn't care for it much). Also, apple slices, berries, cucumber, grapes, and cake. The bear is made out of cheese, ham and nori. BF had a rough day so I figured it would cheer him up. BF counted fifteen different foods and they're cuter than the last few, so I think they were a success! Bottom is onigiri (I stopped putting nori on mine because I don't really like it), asparagus, zucchini, lotus root cakes with cilantro and chives, tomatos and heart shaped spinach tamagoyaki. Top is lettuce and carrot salad with honey avocado dressing, honey ginger chicken, half a babybel, berries, little cake. I still don't like cilantro, even when made into cute lotus root mini-cakes. BF liked it though. Tamagoyaki is really quick to make in the morning. I blanched the spinach the night before and formed it into an oval strip. Then this morning I rolled it into the omelette, cut it like sushi and then cut each oval roll in half along a diagonal. Flip one side over and voila! Hearts! Tonight I will attempt noodles again! Cross your fingers for me! Top is onigiri (small pork one for me, large tuna one for BF), steamed broccoli, the ubiquitous steamed asparagus (so yummy), cherry tomatos, strawberries, blueberries and raspberries. Dessert was absolutely adorable fruit made of marzipan from the Rocky Mountain Chocolate Factory. And there's some cucumber hiding in there somewhere. I ordered some new bento boxes over the weekend, I'll post pics when they get here. And then tonight I'll do up some noodles and/or meat for tomorrow. Bottom is shirataki noodles stir fried with zuchinni and carrots, steamed broccoli and seasoned bites of chicken. Top is cucumber flowers, little tomatoes, half a mini Babybel, little cake, the last of the strawberries and blueberries, kiwi and oranges. Neutral bottoms and bright tops! I snuck in some koala shaped cookies in the top with the chopsticks too. This was my first attempt at noodles. I made them the night before and heated them up in the morning and they turned out pretty good, although next time I think I'll use a different type of noodle. Udon maybe. Shirataki seems better suited for soups. I also tried to go for a less structured/compartmentalized look for these ones (a very difficult thing for me!). The kiwis were a little soft by lunch time, but all in all, I'm happy with how these bentos turned out. I can officially make fun shapes out of boiled eggs with my six egg molds and two quail eggs molds. So far I haven't been able to find fresh quail eggs, only canned (scary! but I will probably try them anyway). I also got a couple of sauce containers for BF because right now the only ones I have are pink with pretty sakuras on them, and some different shapes of onigiri molds. Most exciting are the cutters on the bottom left. 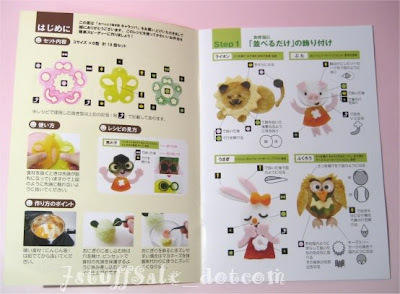 They are to make all different shapes, and they come with an idea book to help make faces. So hopefully my bentos are about to become a whole lot cuter! I wish that the book had english translations though, because I'm not sure what kinds of food they're using for a lot of the designs. I'm sure I'll figure it out though. This was my first try at putting together a rice dish in the morning, rather than just throwing in a few onigiri, and it was yummy but not much to look at, rice, sweet egg, spiced ground beef and snow peas. Then we have tomatos, asparagus and carrots. I fried up some potstickers (pork for BF, veggie for me), and boiled some edamame. This was my first try using little containers inside the bento, and although practical, I don't like the way they look. Lastly, threw in some berries, orange slices, a couple of bites of cheddar cheese and a little Japanese cake as usual. Tomorrow I plan to try noodles! Not particularly imaginative or creative, but a practical afternoon snack. Here are today's bentos. It's funny because I used mostly different foods from yesterday but they look almost the same. Top is chicken and shallot dumplings (recipe from http://www.cookingcute.com/), bok choy stir fried in the sauce from yesterday's beef bento and some sesame oil, boiled egg chick with a lettuce and carrot nest, half a mini babybel, strawberries and blueberries and a little Japanese cake. Bottom is more onigiris from the batch I made on the weekend, steamed green and yellow zucchini, steamed asparagus, more carrot sticks and cherry tomatoes. I decided not to include a side dish this time, because despite how tiny the bento boxes look, we learned yesterday that they hold a ton of food, so they're totally filling without a side dish. No bentos tomorrow, work is having lunch catered for a conference we're hosting. So I get to sleep in!! Top is little Japanese cake, strawberries, blueberries, apple slices, cheddar cheese, stir fried beef. Bottom is onigiri (pork stuffed for me, one bonito flakes and one tuna for the BF), cherry tomatos, asparagus and cucumbers. Side dish is boiled edamame and sweet potato. So fun!! I love bentos!!! I've decided that cute Bento lunches are too much like art to just eat without taking a picture of them first, so this is where I'm keeping those pictures. I'll add more resources (places to buy supplies, good books, etc) later when I have more time.